They enjoy wide-ranging bureaucratic authority beyond the purview of Congress, earn six-figure salaries, and exhibit political views that reflect a distinct tilt to the left. They're called President Obama's "czars," special advisers with sweeping powers, and Obama has gone far beyond his predecessors in naming nearly 40 of them to high-level positions. From health reform czar, border czar, counterterrorism czar, urban czar, and global-warming czar to faith-based czar, domestic violence czar, stimulus accountability czar, Eurasian energy czar, Great Lakes czar, and safe-schools czar, they almost all have several things in common: They were never elected, they were never confirmed by the Senate, and they have immense power over our government and our lives. 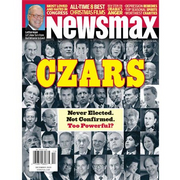 When green jobs czar Van Jones resigned amid controversy over past inflammatory statements, Newsmax opened a special investigation to find out who are Obama's czars and what their real agenda is. Newsmax magazine's special report "Obama's Czars" takes an in-depth look at Obama's army of advisers, who seem to some critics part of an audacious end-run around congressional authority. Do these appointed czars threaten our democracy? Rep. Boehner: Empowering czars is "a subversion of the Constitution"
The talk-show host called Jones' "chief tormentor"
Why the administration eschews the term "czar"
Rep. Kingston: Czars form a "shadow government"
The czar Glenn Beck calls "the most dangerous out there"
The adviser Obama "will never say no to"
Next up: A czar of czars? Are GOP election wins a prelude to 2010?